View of deck and parapet from south east. Digital view of E 26767 CN. Detail of inscription on parapet, Findhorn Bridge. Not to be confused with Tomatin, Neacrath Bridge (NH 80302 28770), for which see NH82NW 26. 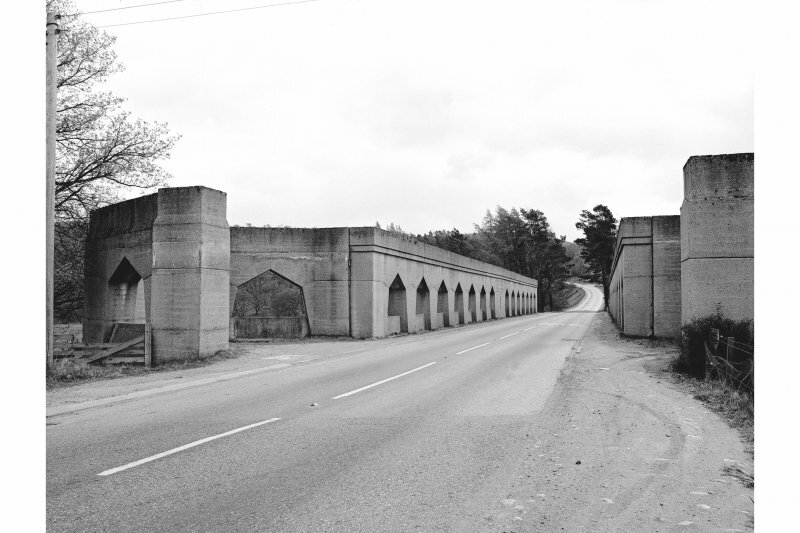 For predecessor bridges (location cited as NH c. 8041 2774), see NH82NW 57. (Location cited as NH 803 277). 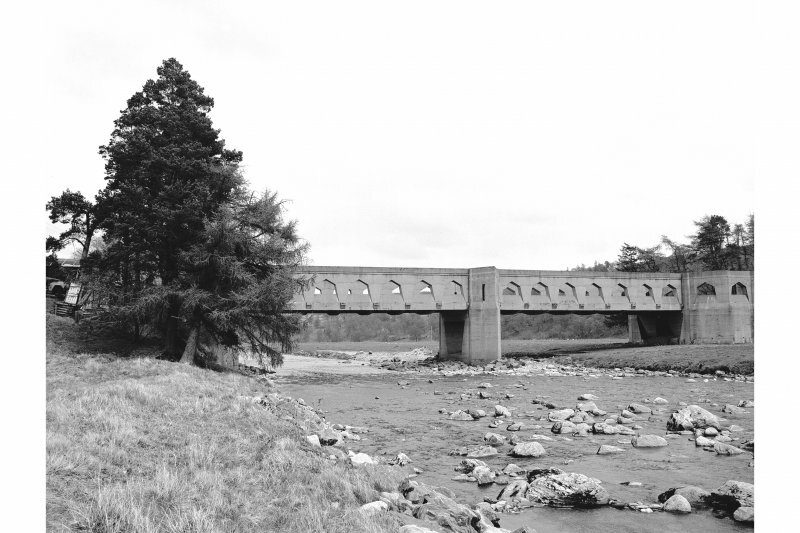 Findhorn Bridge, Built 1926, engineer Sir E Owen Williams. 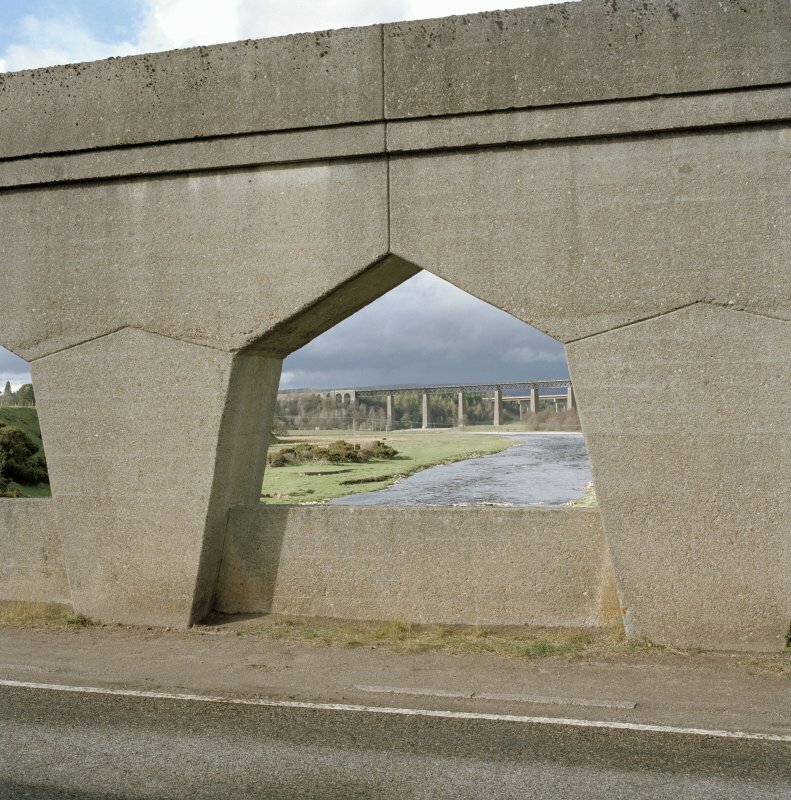 A most unusual two-span, reinforced concrete bridge, with 96ft (29.3m) truss spans 'somewhat of the Vierendeel type' (British Bridges, 1933). 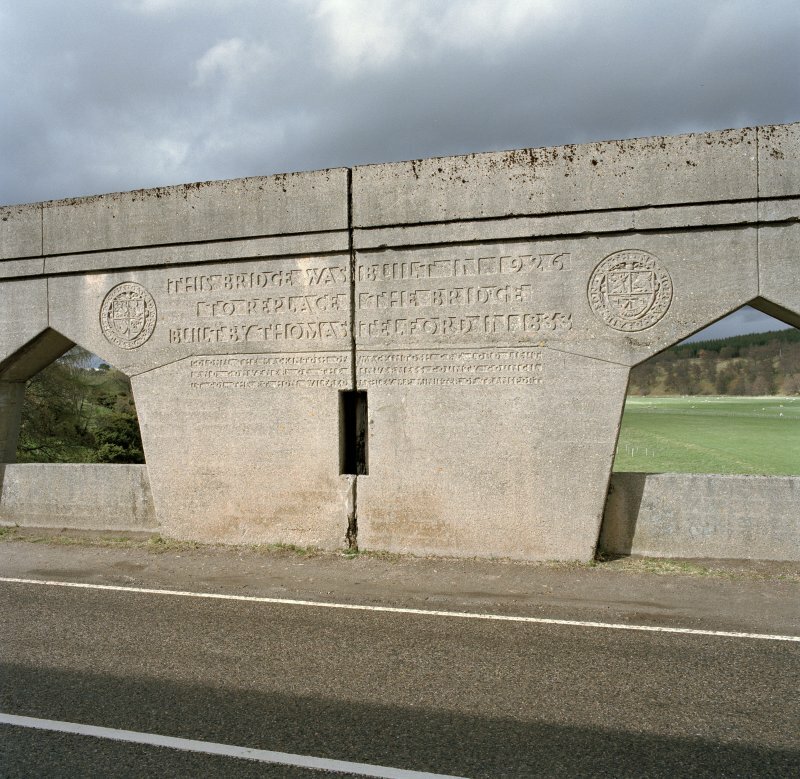 Findhorn Bridge, 1.1km S [of Tomatin], 1925-6, by E Owen Williams, with J W Simpson and Maxwell Ayrton as consultant architects. 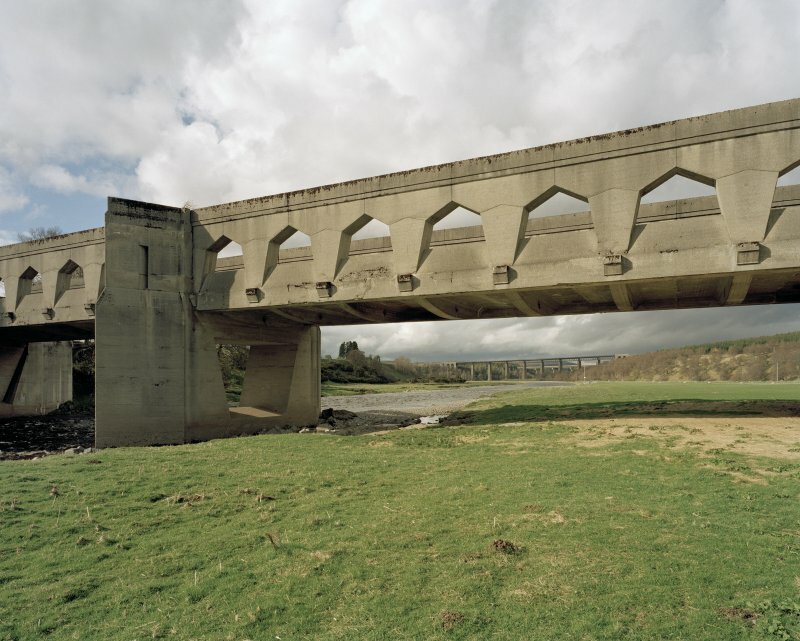 Two 29.3m spans of reinforced concrete with a massive central pier. 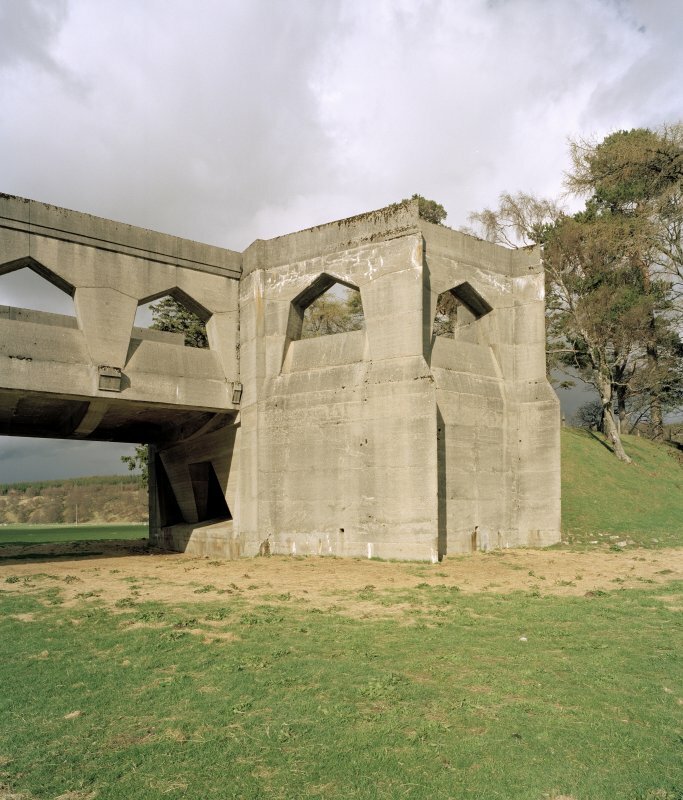 High concrete parapet pierced by semi-octagonal 'windows'. 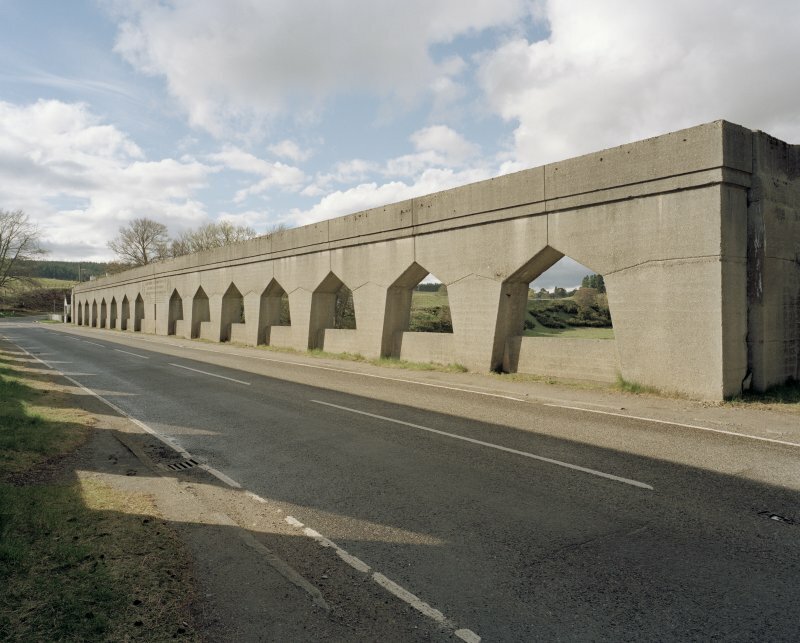 This B-listed structure, a substantial two-span reinforced concrete bridge, was recorded as part of the Listed Buildings Recording Programme for 2001-02 to increase the hitherto very limited coverage of it in the NMRS. 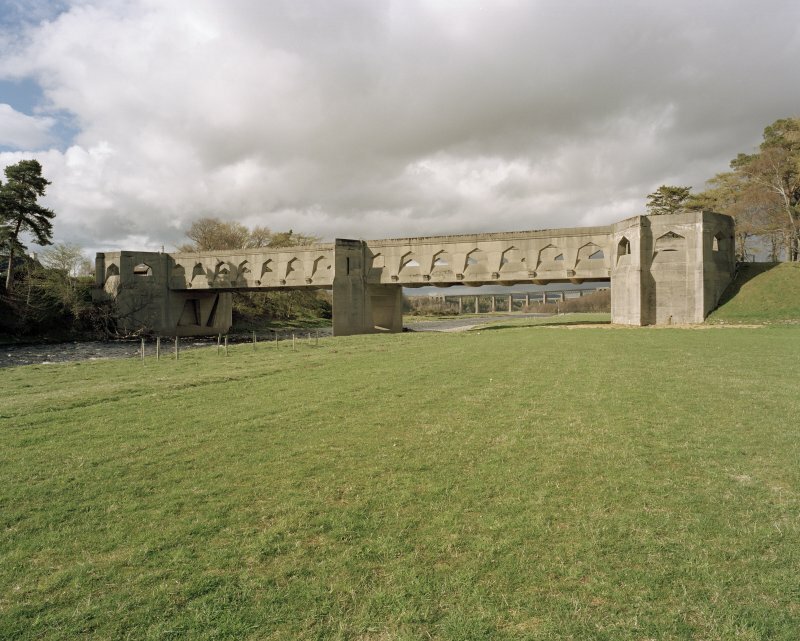 Designed by the engineer Sir E Owen Williams and dated 1926 (information given in a legend cast on the middle buttress on the east side, facing the roadway), each of its spans measures some 29m in length. 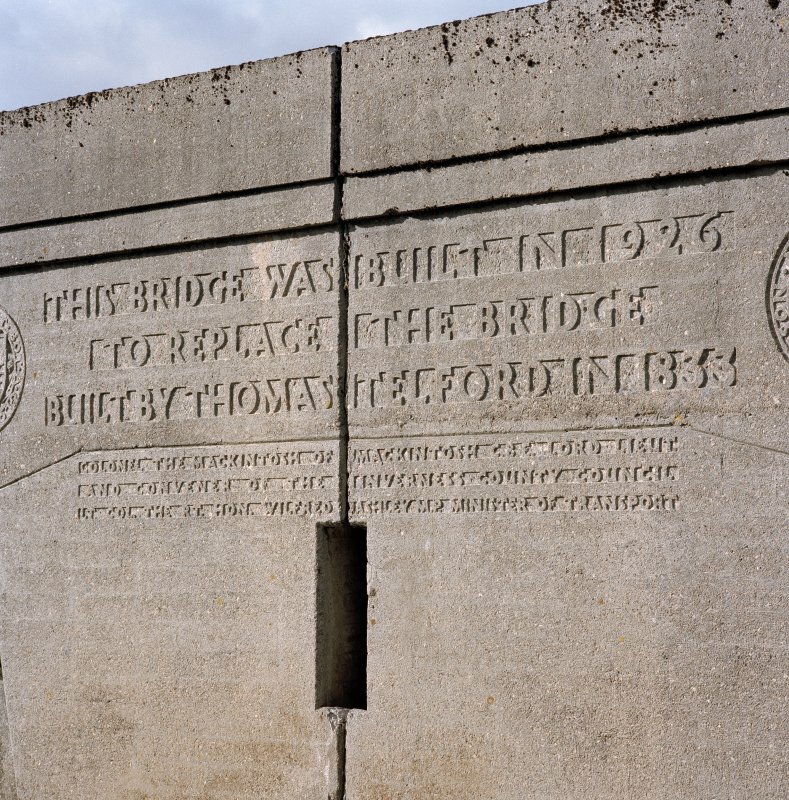 The information in the legend records that it replaced a bridge built by Thomas Telford in 1833 which in turn replaced his earlier bridge damaged in the great flood of 1829. It also records the involvement of Colonel the Mackintosh of Mackintosh CBE, Lord Lieutenant of the Inverness County Council and of Lt. Col. The Rt. Hon. Wilfred Ashley M.P., Minister of Transport. The design is a good example of an 'engineering architecture' approach to bridge design, with the distinctive use of triangular-headed arches (14 each span) to the high parapets. 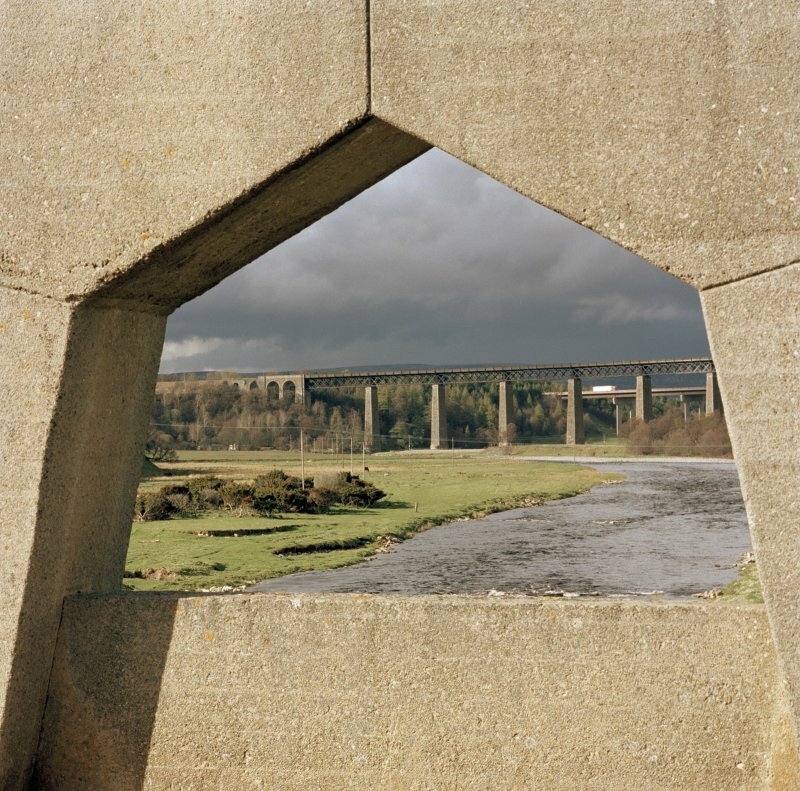 Each truss of the two spans is supported by a substantial central pier with cut-waters which are triangular on plan and the massive bank abutments have distinctively wide refuge bays. Information from RCAHMS (NMC), January 2002. 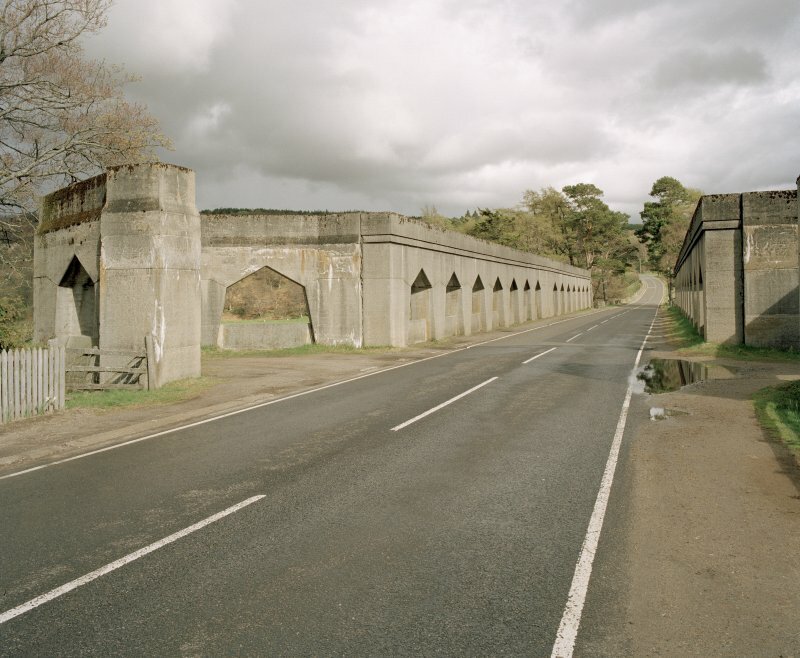 This bridge carries the former line of the A9 (T) public road over the River Findhorn to the S of Tomatin village. The location assigned to this record defines the centre of the river crossing, which ios apparently to the N of the midpoint of the structure. The available map evidence suggests that the bridge extends from NH c. 80397 27749 to NH c. 80466 27716.